Braille and Audio Reading Download (BARD) is a program offered by the National Library Service and Braille Institute Library that allows patrons to digitally download both audio and e-Braille titles from an extensive collection of titles. E-braille users would need a refreshable Braille display to read the books. 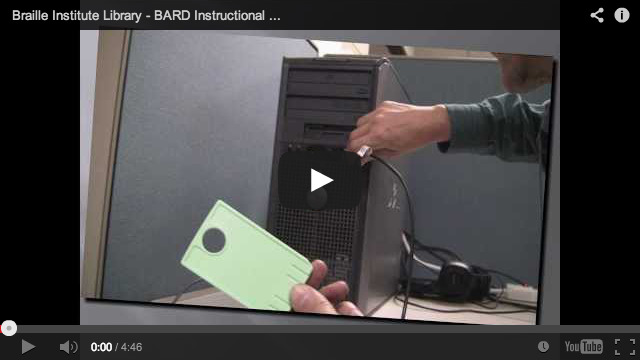 To use BARD, you must have a Braille Institute Library account. After you have a library account, you must also obtain an account at the BARD website. In addition, you will need a digital talking book player, a computer with internet access, and a USB storage device if you are using an NLS digital machine. Once you have an account, you can save the books to a storage device and play them on your digital talking book player. E-mail us at bils@brailleinstitute.org for assistance with this process. The video below will give you an overview of how to use BARD. After watching, you can read more detailed information below or proceed directly to the BARD website and apply for your account. NLS will send a confirming email to allow access to BARD. A computer and a high speed internet connection is required. One will also need a blank cartridge or conventional USB flash drive, sometimes referred to as a jump drive or memory stick. Each book on the BARD site has a download link. Press enter on the link to start the download process. You will be prompted to Open or Save the file. Choose Save. Another screen comes up which you can navigate with your tab key to take note of where the file is being saved. Press the space bar on the save button to start the download. With no cartridge or USB thumb drive connected, press the Sleep button ten times. The serial number and the software version will be announced repeatedly. Press the Play button to stop this announcement. Unzip the folder containing the files for the downloaded book and paste those files to the root directory of the flash drive or other storage medium. Do not place in a folder or subfolder. Plug the flash drive into the USB port located just behind the earphone jack of the digital machine. The machine will recognize the book as an NLS book and start playing. Unzip the book to a folder. Paste this folder to the root directory of your thumb drive. You can put multiple books on a thumb drive and a machine with software version 2.1 or later will recognize them. You can press and hold the play button to enter the bookshelf function, and use the Forward and Rewind buttons to select a book. Locate the book you want to unzip. Press the “Windows Context Key” which is to the left of the right hand control key on the keyboard. A “wizard” opens up. Continue with the process by pressing the spacebar on the next button. The wizard will then tell you the folder where the files are going to go. You can accept that folder and press “Next” with the space bar. The wizard will then start to unzip the files. This can take a minute. When the wizard is done you will be presented with the final dialog. There is a checkbox to show extracted files. Uncheck this box by using the space bar. After you’ve unchecked this box, tab to the finish button and press the spacebar. At this point, locate the folder you’ve unzipped the downloaded book to. Press “Control-V” to paste the book to the flash drive. You may purchase and blank digital cartridge to use for your book downloads. A 2 GB cartridge will hold approximately 20 NLS books. You will need a USB cable along with the blank cartridge in order to use them for your downloads. Connect the cartridge to your computer using the USB cable. Transfer downloaded books to the cartridge. Disconnect the cartridge from the cable and insert it in the front slot of your player for playback. If you have any questions, call the Library at 1(800) 808-2555 and speak to someone in the Registration department or e-mail us at bils@brailleinstitute.org.